Universal 400 rakes, teds, windrows and spreads, all in one machine. 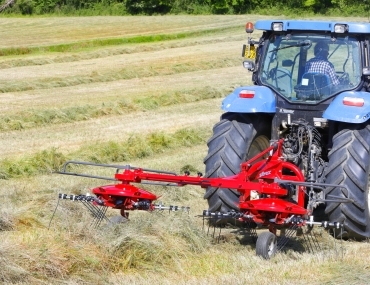 This new machine has been studied to meet the most advanced requirements in haymaking. Through simple adjustments you can make it suitable for all working conditions and it is very easy toperate. Furthermore, due to the pivoting wheels under the rotors, Universal 400 follows the tractor movements. The working width can be adjusted by extending the frame: from a min. width of 3.10 m up to a max. width of 4.00 m. For transport the machine is folded up to 2.25 m width. When spreading the tine arms are locked. When windrowing the tine arms are unlocked, i.e. they are set in the cam. To change from spreading into windrowing and vice versa it takes only a few minutes and it can be done on the field. The machine is fitted with wider tires to increase ground adherence, particularly on rough terrains.